Ahead of her wedding to American singer Nick Jonas, actress Priyanka Chopra celebrated with a pyajama party with her girl gang including actress-cousin Parineeti Chopra, heiress Isha Ambani and Game of Thrones*star Sophie Turner.Priyanka shared a few pictures from the party on Instagram. She is seen posing in a white striped nightwears. 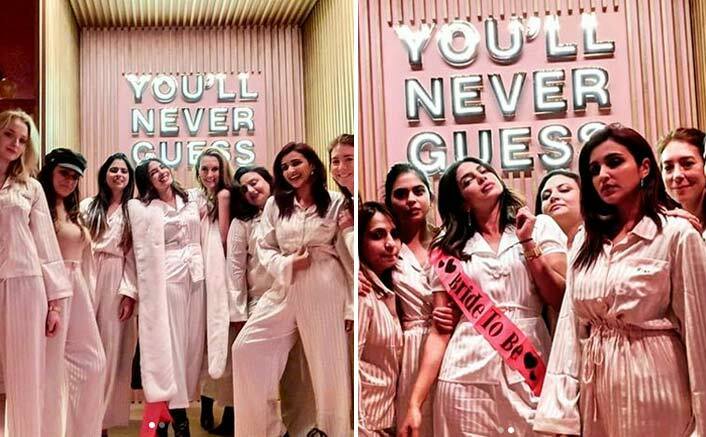 Priyanka Chopra’s Pyajama Themed Bachelorette Party With Her Bridesmaids Looks Like A Dream!“Payjamas are cool… bride squad. Payjamas and heels,” she captioned. Priyanka was in Amsterdam over the weekend to celebrate her pre-wedding festivities.Priyanka and Nick are reportedly getting married at Rajasthan’s Mehrangarh Fort in December. The two got engaged in August in a traditional ceremony at her residence in Mumbai.The post Priyanka Chopra’s Pyajama Themed Bachelorette Party With Her Bridesmaids Looks Like A Dream! appeared first on Koimoi.